For many people, the beach holiday is still the most popular holiday. Endless white beaches and children building sand castles. But what hardly anyone knows: We are not only walking on the beach on sand. Sand is basically everywhere. We find it in glass, cosmetics, toothpaste, microchips, smartphone screens and especially in buildings. In the meantime, the quartz granules have mutated into the most consumed natural raw material worldwide, just after water. Without this inconspicuous resource the world would stand still. But the sand grains are getting scarcer. The construction industry is the largest consumer of sand at all. Two-thirds of the buildings are made of concrete. Two-thirds of the concrete is sand. Other ingredients are water and cement. For an average single-family house 200 tons of sand are needed. For a kilometer of highway even unimaginable 30’000 tons of sand are needed. The demand for the small grains has increased 360% in the last 30 years and will continue to grow as population growth and urbanization progresses. China has used more concrete in the past two years than the United States over the last 100 years. For the construction industry respectively for concrete only sea sand can be used. Desert sand grains are ground to round by the wind and the cement cannot adhere to it. 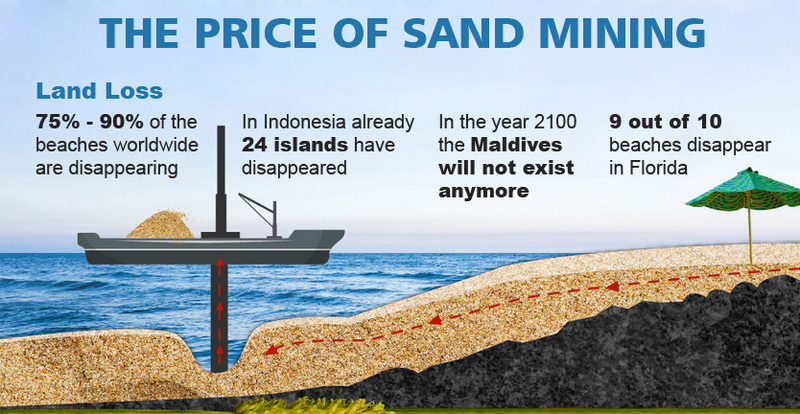 By removing sand from coastal areas entire beaches and entire islands disappear. After the sandy deposits on river banks and beaches have been exhausted in many places, the sand extraction is now concentrated on the seabed. At a price that our environment and we all have to pay. The massive dredging of the seabed destroys the habitat of innumerable creatures and destroys entire coral reefs. In addition, the natural coastal sand barrier disappears and the saltwater seeps into the ground. As a result, the groundwater is damaged and the land is largely unusable for agriculture. In addition to these environmental consequences, sand extraction also has a high potential for conflict. In the meantime a huge black market has developed around the precious resource. In India, for example, the sand mafia is the country’s largest criminal organization, illegally mining and selling 2 billion tons of sand annually. That’s nine times the amount of sand mined in Germany. In Morocco, the sand mafia controls 45% of the sand trade and removes entire beaches. Studies predict there will be no beaches by 2100 if we continue to plunder the earth’s sand resources. We need to be aware of the sand scarcity and change our way of life.